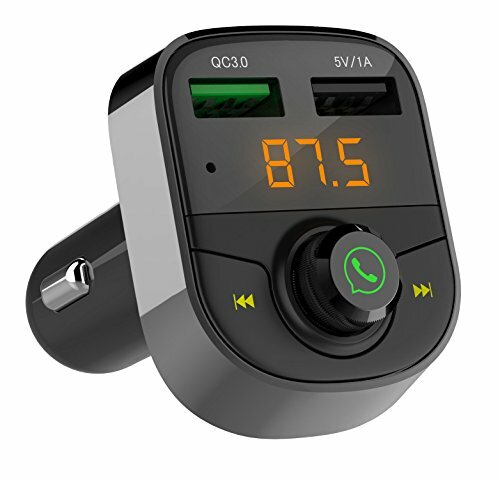 DUAL USB CAR CHARGER :QC3.0 Fast Charger (Qualcomm Certified) can offer quick charging for your device.1.0A usb port can read USB MP3 music and charging. BLUETOOTH : Wireless bluetooth receiver and FM transmitter adapter,Transfer Calling / MP3 Music / Smartphone Voices to car radio speaker. (FM range from 87.5 to 108 Mhz).Compatible for iPad,iPhone 8,X,7/ 7 Plus, 6S/6S plus, 6/6 Plus,Samsung Galaxy ,Google,LG,HTC Blackberry,any device with Bluetooth. HANDSFREE FUNCTION : Built-in Microphone,Switch to portable hands-free mode automatically from music playing status when receiving phone calls.Answer/Reject/Hand up/Recall all in one key. CAR BATTERY VOLTAGE FUNCTION : Show 3 seconds car voltage when plug into cigarette port.Always keep battery health.Then turn to automatic play music mode. MUSIC PLAYING : Support Bluetooth Music/ USB Disk/ MP3/WMA player. With anti-interference performance and noise suppression (CVC) technology.Automatically connect memorized paired when power on. If you have any questions about this product by LIHAN, contact us by completing and submitting the form below. If you are looking for a specif part number, please include it with your message.